Google’s upcoming flagships, Pixel 3 and Pixel 3XL is expected to be released this October. However, a new unboxing video has revealed Pixel 3XL in its entirety. A Ukrainian blogger by the name Ivan Luchkov has posted a video of a white Pixel 3XL that uses the AnTuTu app. This reveals specifications, in-box content, and more regarding the forthcoming third-gen Pixel smartphone. The same blogger had earlier posted an unboxing video of Pixel 3XL confirming the addition of USB-C headphones. The video reveals that the Pixel 3XL will have a massive 6.7-inch screen. This is 0.7-inches bigger than the Pixel 2XL and 0.3-inches bigger than the newly launched Galaxy Note 9. The Pixel 3XL is the largest mass-market smartphone ever made. Other specs reveal that the phone will have a 2960×1440 display and 494ppi. It will come with 4GB of RAM and 64GB of non-expandable onboard storage. The device is also shown running Android 9.0 Pie out of the box and a Snapdragon 845 chipset. The Pixel 3 XL will apparently boast three front-facing cameras, all of which are 8.1MP. It will also have a single 12.2 MP camera on the rear. The device is by a 3,430mAH battery, which is disappointingly smaller than the 3,520mAh battery included in Pixel 2 XL. 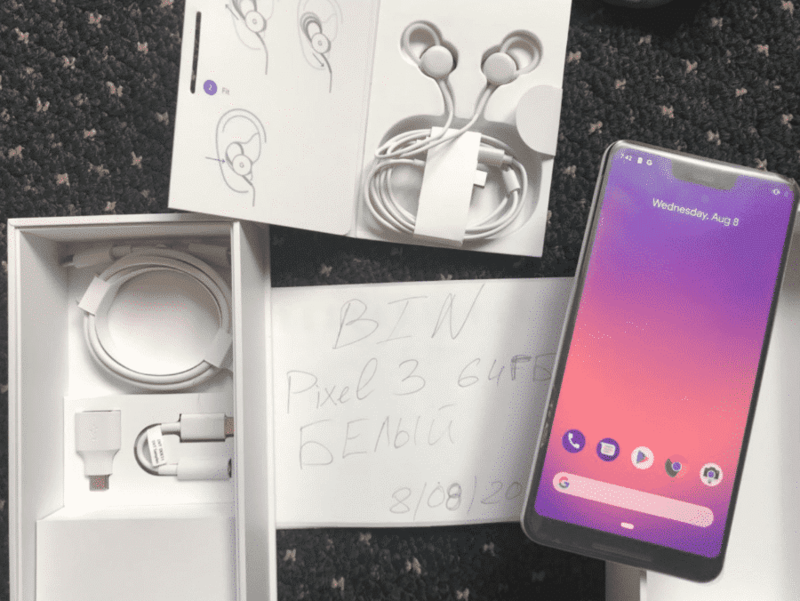 Images from the unboxing video also reveal that the Pixel 3 XL will come with a USB-C cable, USB adapter, 3.5mm adapter, and a pair of headphones that looks similar to Pixel Buds with a USB-C connector. Since the Pixel 3 XL is still in the processing stage, there are chances that the hardware and features may vary when the Pixel 3 XL is finally launched.